A Memorial Service serves emotional and cultural needs to say goodbye to a deceased loved one. It is at these moments when a life long commitment to a spiritual path comes to fruition. We accompany our loved ones only so far and then the path to the great beyond is for them and them alone. How we honor their lives says something about the meaning of their life as well as how we will continue with our own lives. Many services involved in a Memorial service are options, to fit your needs. Call and ask for specific prices for various elements. We have a well-appointed room that seats 150 people. It is a serene space to say goodbye to your loved one. We will oversee the service. A clergy member or family representative can lead the service. Loosing a loved one is hard enough without the extra heartache dealing with the expenses of saying goodbye. This is why we are honored to offer you a casket at no additional charge. If you wish to combine a viewing and a memorial service, we can accommodate you. 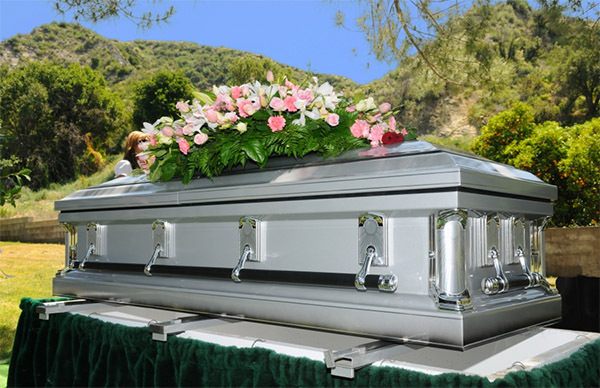 We can prepare your loved one for a viewing including embalming, dressing, cosmetics and casketing. We can prepare for you and your guests Prayer cards of remembrance as well as acknowledgements. We can provide a Register book for guests to write their comments. Our visitation room is special space that will allow you to pause, take measure of the life that has passed and your own life, as one so often does at a funeral service. Our space is clean and bright with comfortable seating. We can seat up to (HOW MANY?) people. From the moment you enter, you will feel part of a sacred rite, the hallmark of your culture. Bring to this space your own religious rituals and meaning, and you will be experiencing a rite of passage of a soul to the great beyond. You can take part in rites that are eons old, or you can create your own that will have special meaning to your family. We are there to make it happen for you. One of the wonderful things about a memorial service is that it can be a stand alone event or part of a larger whole which may include a graveside service as well. We will work with your to make the memorial service all you want it to be, we will do so with respect and integrity.